The business of content marketing is the business of ideas. Blog post ideas, newsletter or ebook ideas, ideas for courses or whitepapers—we need them all. And we need a lot of them! In most cases the general focus of our content will be set by business purpose. Business blogs must focus on topics that support the product offering. To support the business, with a profitable blog, content creators take a static subject area and write about it over and over again in (hopefully!) fresh and engaging ways. It’s a bit like rotating a gemstone and describing how the light bounces off different facets. As content areas become saturated, and competition for attention increases, it’s more important than ever to be adept at finding topics closely related to our main subject areas. In this post, we’ll look at how data can augment our creativity and help us discover endless blog post ideas. At times, usually early in the life of a blog, it’s easier to come up with blog post ideas using creativity, intuition, and industry knowledge. But at some point we’ll run out of ideas, or we’ll be asked to justify the ideas we do have. Customer interactions are a huge help at this point. Ask your customer success team what they think your customers are interested in. To make that input practical, try the 10×10 exercise recommended by Stephanie Liu from Lights, Camera Live:. Take a sheet of paper and fold it in half. On one side write the 10 most frequently asked questions about your product or service. On the other, write the 10 questions people should be asking about your product or service but aren’t. Now, you have a list of at least 15 – 20 things to blog about. Data can Augment and Simplify our Blog Post Idea Generation. Google Analytics or other tools track site visits, and social signals help gauge audience interest, so we can iterate on our current blog post ideas. 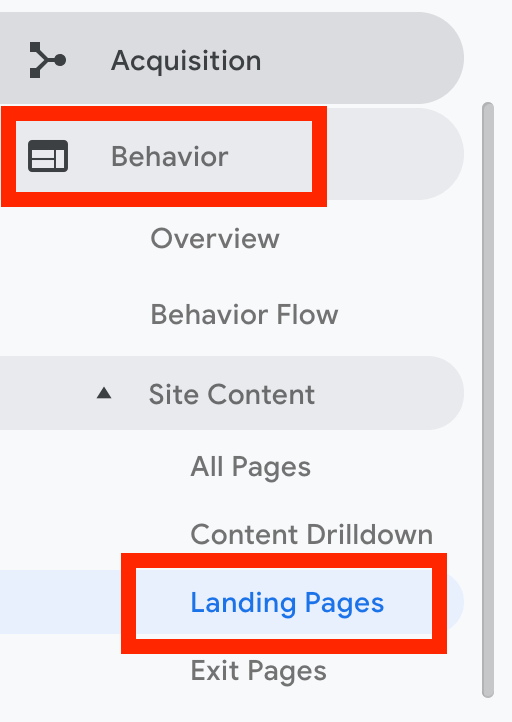 To track site visits to a particular blog post, you’ll need the Behavior section of Google Analytics. Apply a filter to limit the results to only your blog pages. This data will show you which of your posts draw the most visitors. And, the Average Session Duration will tell you if they stuck around long enough to really engage with the content. Social engagements help us to see what audiences are interested in. For example, our most shared posts at BuzzSumo this year are lengthy guides or research reports. Social engagement is a great proxy for audience interest. When we know that content about one facet of our product is grabbing social attention, we can increase our connection with our audiences by leveraging that topic. In addition to looking at analytics and social shares, it’s also critical to drill down into industry sources– reading, researching, and documenting trends as we go. To truly benefit from this approach, consistency and commitment are required. Ann Handley, author, speaker, and Chief Content Officer at Marketing Profs, recommends collecting and recording five writing ideas each day. Finding and qualifying blog post ideas is time-consuming, especially if you write many posts a day or work for multiple clients. 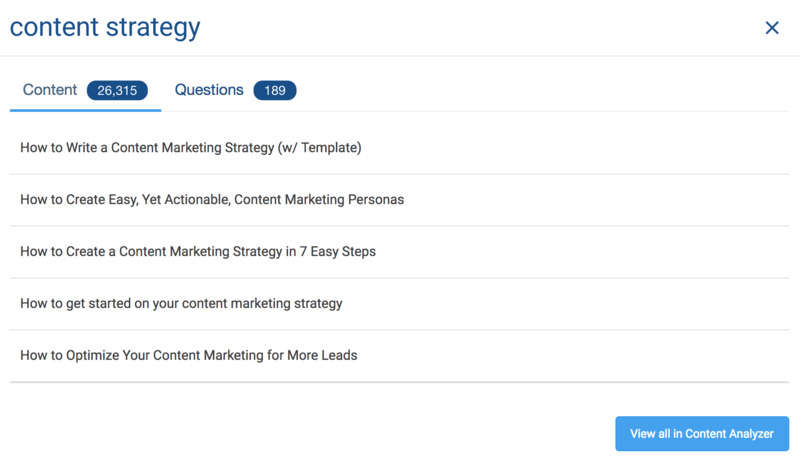 The BuzzSumo Topic Explorer is one way to save time. It suggests related topics, popular content, AND a key question for any subject you write about. 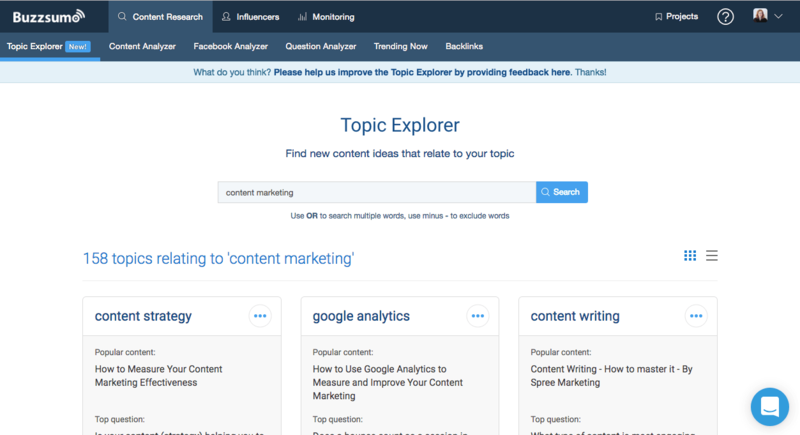 The Topic Explorer adds a layer of artificial intelligence to our platform, allowing content creators to expand their reach (and their blog post ideas) to new subject areas. The Topic Explorer’s question suggestion is curated based on relevance. Each related topic includes additional subtopics to explore. Once you know your audience’s preferred content formats, it’s easy to combine them with related topics to generate new blog post ideas. For example, our audience likes original research and “How to” posts. And, for our main topic area, “content marketing,” The Topic Explorer recommends the following related topics. 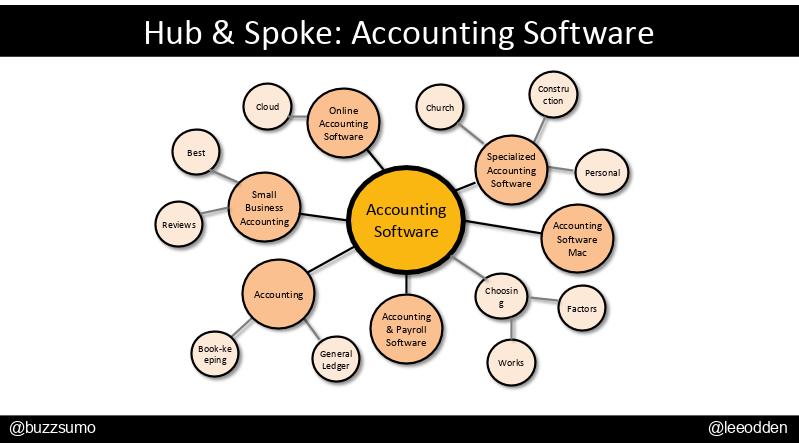 The table below shows how I might combine the two to come up with blog post ideas. Another approach would be to look at individual questions in the related topics and work through them, adding How, Why, or List posts formats to create working titles. Infographics are also a great way to answer questions! Any source of related topics can be put through this grid to spur creativity! If you have ideas from conference agendas, or from Google related searches, or from Pinterest auto-suggest, add them to your grid for even more blog post ideas. When faced with a saturated or overly competitive topic area, what do you do? More ideas for the same saturated topic won’t necessarily help grab attention if there are already hundreds of thousands of published posts. There are two mental models we find helpful to expand topics for saturated content areas. People interested in X are also often interested in Y.
Laterally related topics can also be expressed as part of a hierarchy. 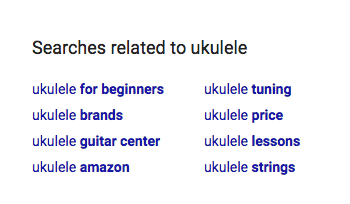 They would simply be listed with the same level of importance. And, specific areas of interest in a hierarchy are only “niche” in the sense that they can be considered a subset of a larger topic area. Niche areas will often have their own experts, big ideas, and areas of ongoing controversy or study. 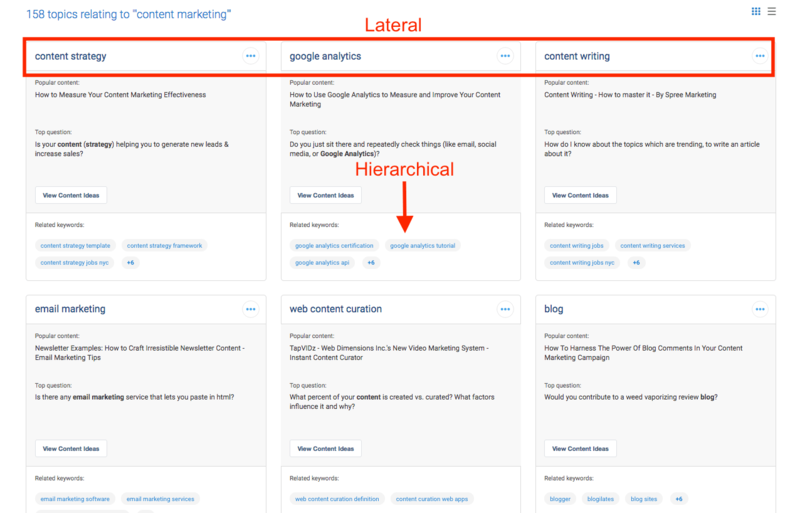 However, the concepts of lateral and hierarchical expansion are useful for developing blog post ideas, especially if our main topic area is heavily competitive or already saturated with great content. The Topic Explorer offers a quick look at lateral and hierarchically related ideas. For each laterally related topic, there are more specific, niche keyword suggestions. And, additional Topic Explorer searches can produce even more related and specific inspiration. Once you have created a massive file of blog post ideas, how do you decide what to write about? Something is either a good idea or a bad idea. But, if you have ever tried to convince your team of either, you know that you’ll need more than a hunch to persuade your boss, client, or colleague. Qualifying topics is done in two phases – before you publish, and after you publish. In both phases data analysis can help guide the process. Customer questions, customer surveys, social engagement with existing content, web traffic data, industry trends and thought-leader input all help us to select the best blog topics. If you have a file of customer questions or survey responses try running them through a text analyzer to see which themes emerge. (Thanks to Gini Dietrich who suggested this approach for developing courses.) You can do the same thing with conference agendas, etc. 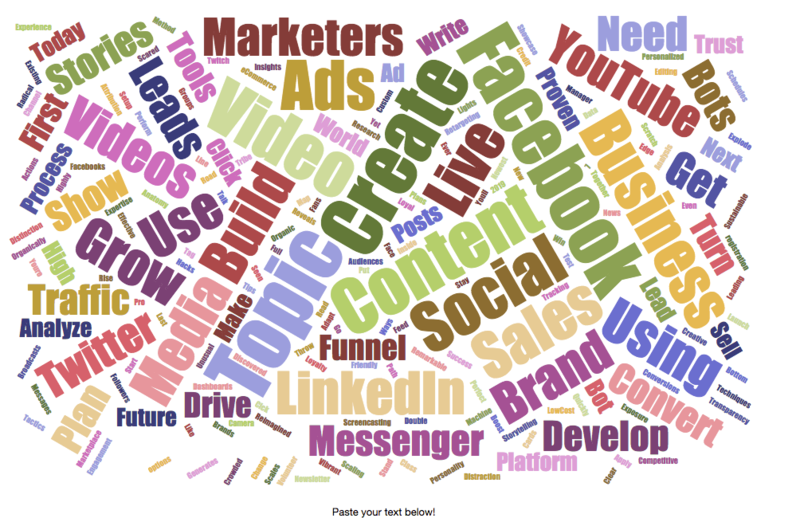 For example, here is a wordcloud of topics from the 2019 Social Media Marketing World agenda, created at jasondavies.com/wordcloud (I removed the word marketing). With this analysis, I can see what industry leaders are thinking about and use these hot topics to validate blog post ideas. For example ‘Facebook Live’, ‘YouTube content’, or ‘use of bots in marketing’ all seem like good blog post ideas. The Topic Explorer, built on BuzzSumo’s database of more than 5 billion articles, offers social engagement data to further validate keywords. BuzzSumo leverages machine learning to suggest topics that creators can rely on, without needing to spend time analyzing line after line of information. Popular posts are those with the most relevance and engagement. 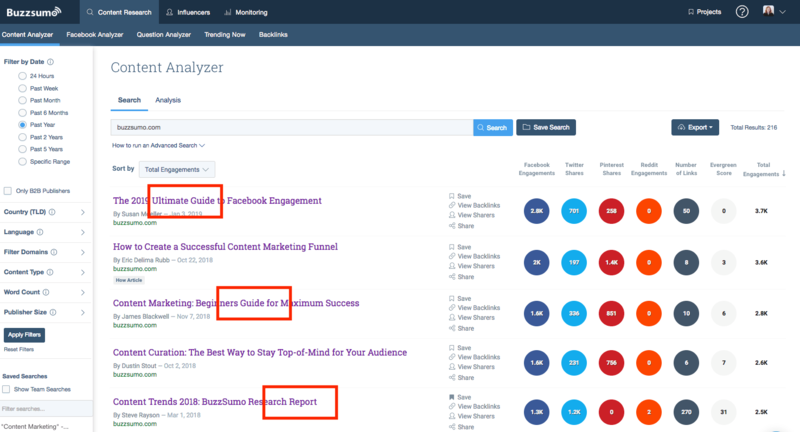 If you navigate to the Content Analyzer, using the button at the bottom right of the popup, you will see the most evergreen topics, or sort to see the topics with the most engagements by network. Fundamentally, content marketing is a quest for site traffic. We spend a lot of time thinking about how to get more people to visit websites. One way to do this is to appeal to a wider audience. If your traffic drops off, writing about a closely related idea may expand your reach to more users. The example comparison below shows far less competition and more average social engagement for the topic “employee engagement” compared to “human resources”. If my human resources site isn’t gaining traffic, employee engagement might be a good expansion topic. 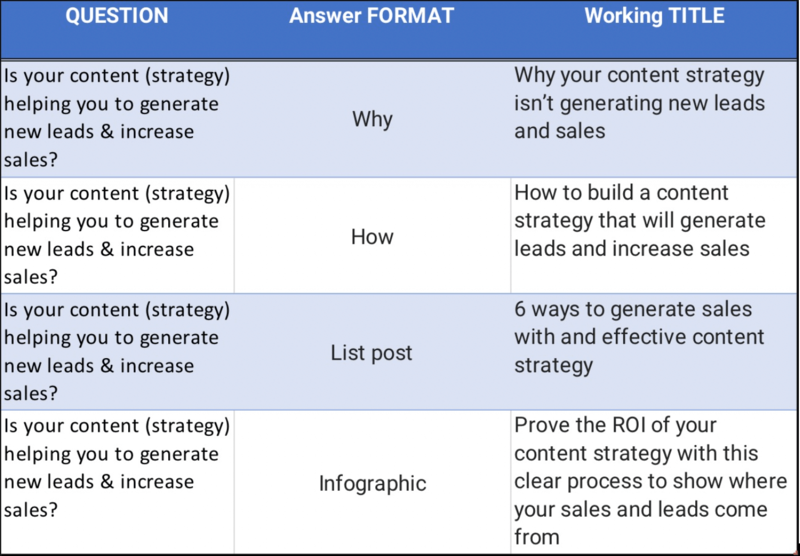 With endless blog post ideas in mind, we’ll need to think about how we use blog content to increase – rather than dilute – the impact of our site. We will also need to design a logical path for users through our content. Lee Odden, co-founder and CEO of TopRank Marketing, recommends a hub and spoke model or a power page approach. In a hub and spoke model, tiers of supporting and related content connect to each other and drive readers toward the hub or central content piece. Consider creating a best answer post as the centerpiece for this strategy. Use The Topic Explorer to chose the best spoke content and be sure you’ve covered every facet by looking at the suggested questions and asking if a customer would find a satisfactory answer on your site. 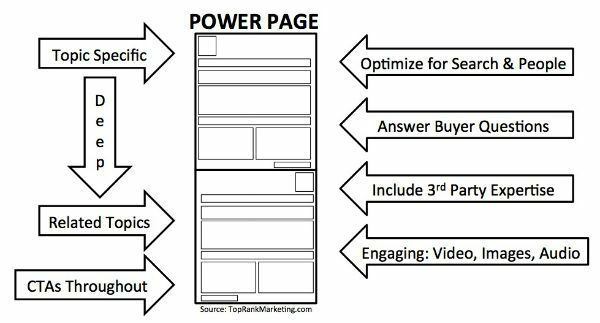 Power pages are based on a similar concept, but they place the supporting materials, primary topic and related resources all on the same page. Whichever layout you choose, a blog idea file filled with related topics is a must to drive business goals.